Over the last few weeks, Denver Public Works has been working to improve walking and biking conditions at 17th and Wynkoop near Union Station. With the A-Line opening and more foot traffic on the way, the old design wasn’t going to cut it. Streetsblog posted photos of the changes when they were almost complete a couple of weeks ago. Now DenverUrbanism has published some great before-and-after photos of the finished project. With this project, DPW intended to stop drivers from blocking crosswalks and the bike lane. While the new crosswalks are an improvement, the bike lane design isn’t working out. One decision in particular will make you scratch your head: Crews installed protective bollards on the gutter side of the bike lane, leaving nothing to stop drivers from blocking the bike lane. That’s exactly what’s been happening. Why choose this design? According to a DPW employee, “the bollards were meant to help prioritize the intersection for pedestrians by discouraging illegal parking in the intersection and discourage illegal turns, and visually direct pedestrians where to cross,” not to create a protected bike lane. The bollard placement doesn’t seem to be working — illegal parking in the intersection continues. Putting the bollards on the other side of the bike lane seems like it would get the message across much more effectively. Hopefully this snafu can be fixed quickly, because the redesign was a good idea by and large. On the intersection’s east corners, painted curb extensions, or bulb-outs, expand space for pedestrians, make the crossing shorter, and should make drivers turn more carefully. 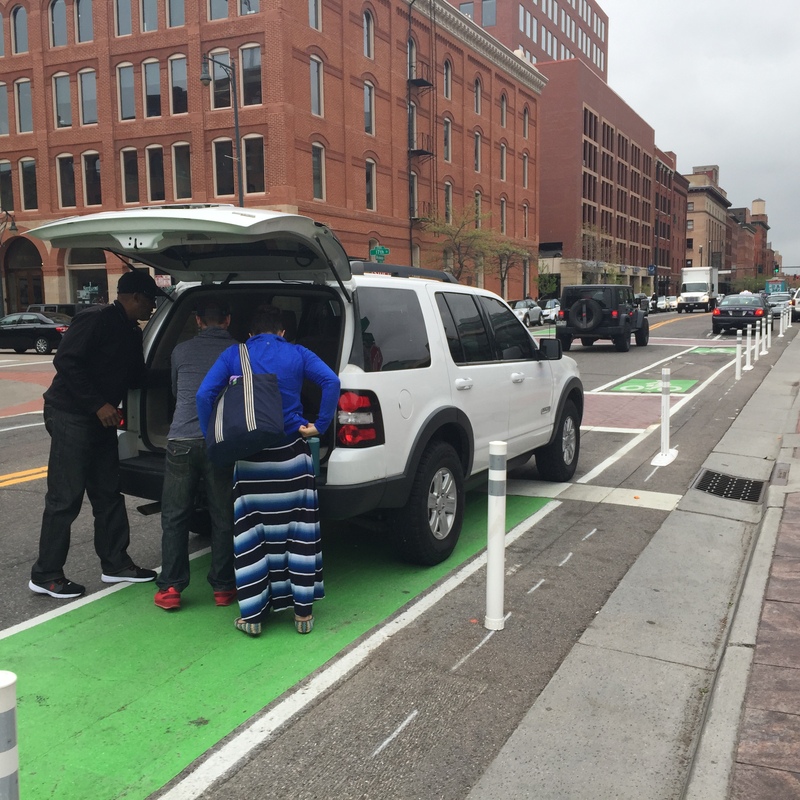 The bulb-outs are protected by bollards, which as far as I know is a first for Denver. 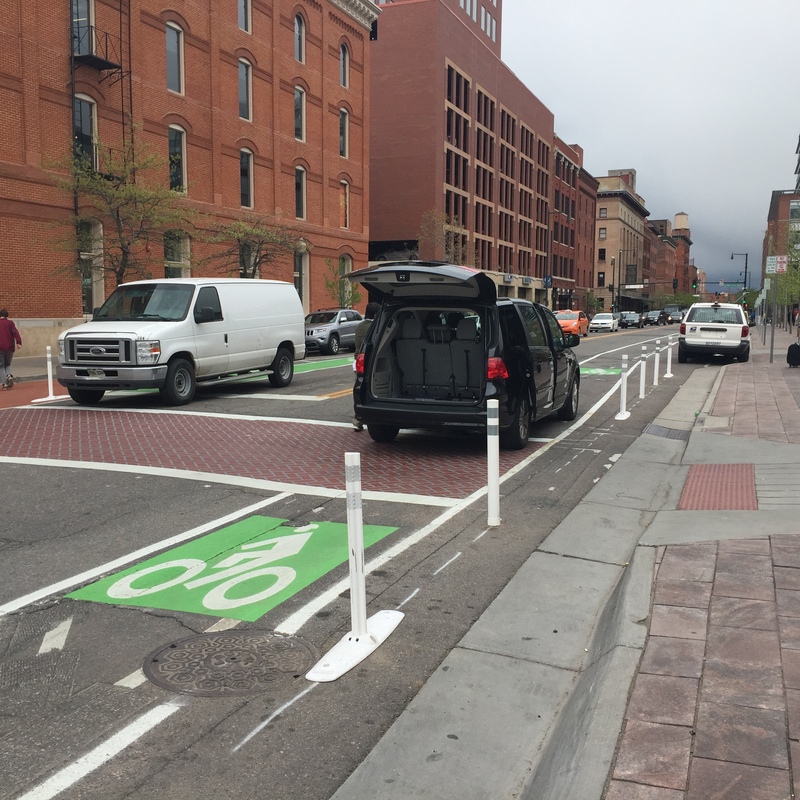 The crosswalks are painted bright green, as are parts of the Wynkoop Street bike lanes. 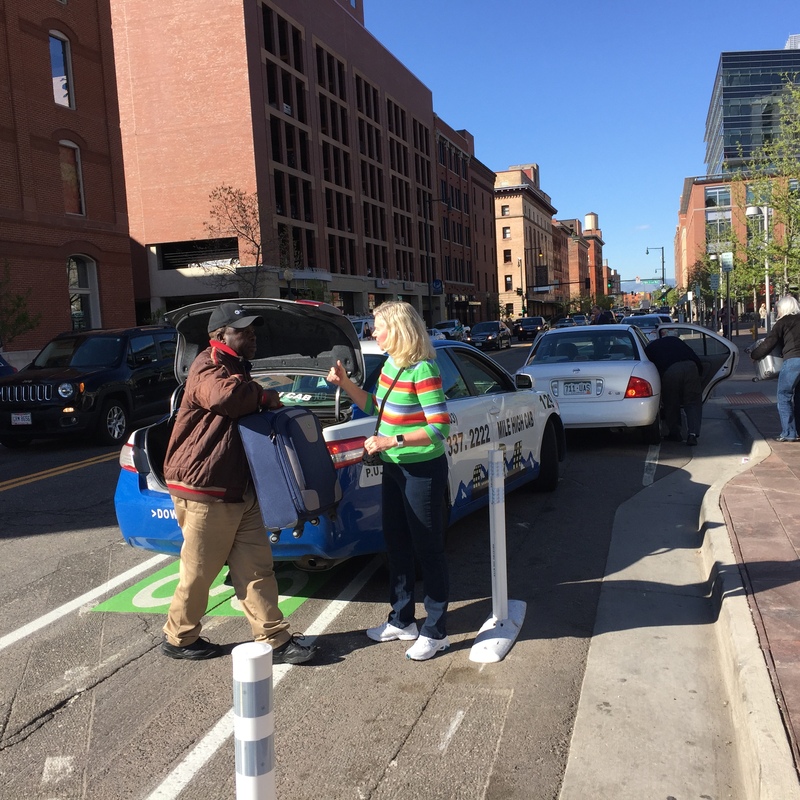 Bike parking, a B-Cycle station, and car-share-only parking have supplanted metered parking spaces on Wynkoop. There’s also a new passenger loading zone. A simple adjustment to the bollard placement should help salvage the Wynkoop and 17th project and make it a win all around. Seems like a great spot to station a cop with a ticket book. Agreed and make some money to pay for more protected bike lanes. Um, stupid. Just own up denver. Too many public works employees hitting the chronic on the clock…? The valet for Venice needs to move to 17th or move to the station side with the other valet. I Think that would solve all of this madness which I ride everyday! To many traffic engineers, double parking in a bike lane is a feature not a bug. It gets car traffic out of the travel lanes and causes “only” a minor inconvenience to the experienced cyclist. It is a shame they think this way. It is not a minor inconvenience if the person using the bike is a child, inexperienced on a bike, or a vulnerable adult. The purpose of bike lanes is that they make cycling available to everyone not just “experienced cyclists” otherwise they might as well just have left the road as it was. Excellent response, KN. Completely agree. Wow, have those engineers even considered what it’s like to ride a bicycle? If you are responsible for the design of bike infrastructure and have not the foggiest idea what you are doing, please do the rest of us a favor and Google ‘bike lane’ at some point between ‘brainstorming session’ and ‘installation of said bike lane. If you have the world’s first concept, you may want to reconsider your plans. What they have here is ok, but they didn’t give the drop-off vehicles anywhere to go. I also agree that it seems the people who try to solve these issues are not people who actually use the system (both cyclists and drop-off vehicles).